Mo Farah, roared home by a cacophony of ear-splitting noise that almost matched his double Olympic London triumph, led another 'Super Saturday' for Britain as memories were reignited in a party atmosphere at the Anniversary Games. On that memorable previous Saturday Farah, Jessica Ennis-Hill and Greg Rutherford won track and field gold for the hosts in the Olympic stadium. 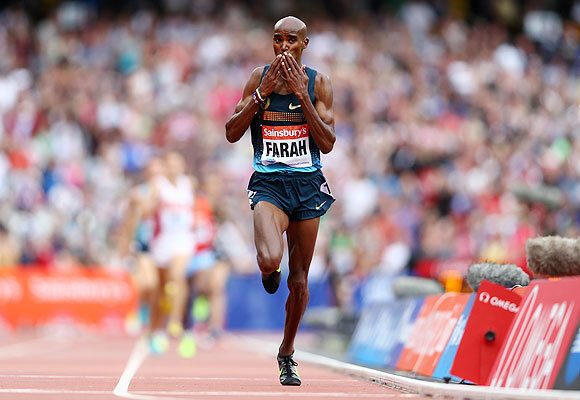 A year to the day from the opening ceremony that heralded a hugely successful Olympics for the host nation, Farah breezed to a facile 3,000 metres victory that primed him for a tilt at the 5,000 and 10,000m double at the world championships in Moscow next month. Christine Ohuruogo, in the 400, and Katerina Johnson-Thompson in the long jump added eagerly-received victories to complete a British treble on the second day of the Diamond League meeting. Like sprinting great Usain Bolt, who anchored his Jamaican team to victory in the 4x100m relay on Saturday following his individual win on Friday night, Farah has become one of the sport's showmen. His infectious smile, talent and crowd-pleasing 'Mobot' celebration help to dispel some of the dark clouds hanging over the sport following recent doping revelations surrounding some of track and field's biggest names. "I wanted to make them (the fans) proud. 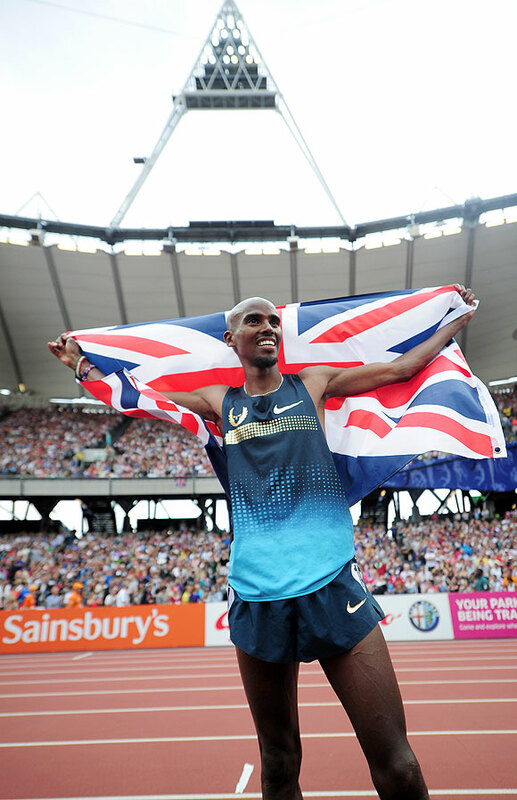 I'm in great shape so it's going well for Moscow," Farah said. The 30-year-old, who delivered his now-trademark scorching last lap en route to a personal best 7:36.85, was one of a number of gold medallists to again show their liking for the Olympic stadium. Hurdles queen Sally Pearson finally found the race rhythm she had been searching for during an injury-interrupted campaign when she set a season's best of 12.65 to ease home in the 100h ahead of Britain's Tiffany Porter. Australian Pearson had been struggling to finish off races after been dogged by hamstring injuries but powered out of the blocks and was never headed. "I'm Olympic and world champion and I'm still showing up and getting defeated but here I am today and being patient and awaiting for my turn and it came out my way," said a relieved Pearson. American Allyson Felix, who finally bagged Olympic gold last year after twice taking silver, had to work in the second half of the 200m to come home in 22.41, ahead of compatriot Shalonda Solomon. "Such a special place, so many memories...," said the smooth-striding Felix, who will seek a fourth world title over the half-lap in Moscow. A huge roar was afforded to Frenchman Renaud Lavillenie when he went over 6.02 metres for a world leading best in the pole vault. Emboldened, the confident Olympic champion then made three audacious attempts at a world record height of 6.16, but his hopes of usurping the great Sergei Bubka will have to wait for another day. New Zealand shot-putter Valerie Adams, beaten by Nadzeya Ostapchuk in the Olympics but upgraded to gold after the Belarussian tested positive for a banned anabolic steroid, increased her season's best to 20.90 and a fourth successive world title surely beckons. Other Games heroes fell short. Shelly-Anne Fraser-Pryce set a world leading 10.77 in the 100m heats but paid for a slow start in the final as she was easily upstaged by Blessing Okagbare. The Nigerian sprinter continued her fine Diamond League season by setting an African record of 10.79 to head to Moscow as a leading medal hope. 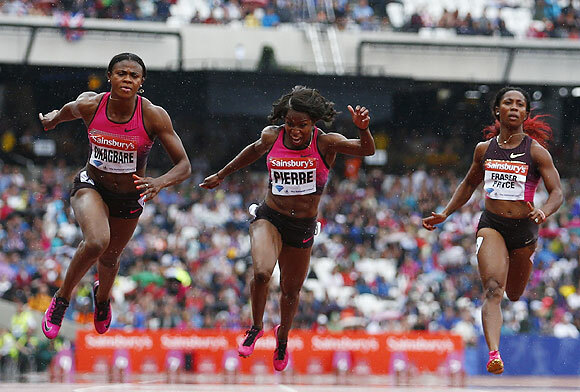 Fraser-Pryce had to be content with fourth while world champion Carmelita Jeter pulled out of the final after suffering a hamstring twinge. 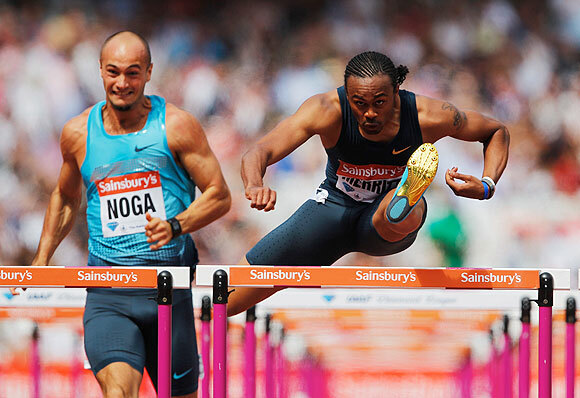 Olympic 110m hurdles champion Aries Merritt's last race before Moscow did not go to plan either, the world record holder coming to a premature halt after clipping the fifth hurdle. "I'm thankful I'm not injured," the American said as he sheepishly waved to the crowd. Olympic 400m hurdles champion Felix Sanchez, who 12 months ago shed tears on the podium after regaining his title at the age of 34, also cut a frustrated figure as the Dominican trailed home last in a race won by American Michael Tinsley, who Sanchez beat into silver in London. "I've been playing around with different strategies this year, but that one was an absolute disaster," Sanchez admitted. Olympic heptathlon champion Ennis-Hill offered few clues as to whether she will be fit to compete in Moscow after putting her injured Achilles tendon to the test. Ennis-Hill, with the lower half of her left leg heavily taped, appeared to run well within herself in the hurdles, showing no outwards signs of discomfort as she took fourth in 13.08. She then competed in the long jump before telling reporters: "I'm frustrated, I need to speak to my coach and have a think. I'm running out of time a bit." Liverpool up for sale for 350 mn pounds?